My nana, Josie would be so very proud! I know I am. It's beautifully done in every way imaginable. Such an honor to be invited in! Page after page of delicious inspirations. Mmmmmmm! I think I'm all set to join the Cute Club! Keep the memories tuned up, the music playing and one day, they'll take you to their idea of Family Woodstock. Rain or shine, we're rockin' and rollin' this weekend! All 7 of us! I was going crazy trying to identify a birdsong that is everywhere in the air around the house for weeks. The only word I could come up with to describe it was a "twittering" sound, but you know that got me nowhere searching the internet. I started to think maybe it was a tree frog. But today I saw it, way up high on its tree perch and I glimpsed the silhouette with the binoculars. I do believe it's a chipping sparrow though at first I thought it was a worm-eating warbler. They sound a bit the same. (Use the listen button on the links.) Can you see why it was hard to describe? Much more the second track of the chipping sparrow though not sewing-machine-like at all, in my opinion. It's a twitter! There's always room for improvement - it's the biggest room in the house. I finished the wedding pillow for Alison and Joe! A few notes about stitching these samplers up. * I generally use perle cotton size 8 and randomly pull colors from my stash as I work. (As you can see, this one was simply white thread.) I experiment with stitches old and new depending on my sense of adventure. Love the short back stitch! * The printed designs do not wash away. The lines may show a little after stitching, but that thread weight covers them pretty well. * Also - I really recommend that before stitching you cut a slightly larger piece of muslin or cotton and use that as a second layer to stitch through. It hides the backwork and also makes for a sturdier finished piece. And if the margins around the design are a little tight for your hoop needs, it helps to stabilize the design and make it a little bigger all around. Although I haven't seen it yet, the new issue of Mollie Makes has a feature about my Josie's Garden sampler design. I'm so excited and flattered to be included! On their site just now to grab a link- oh, my goodness- they made the cutest ever promo video!! Shadowboxes. I'm so glad I chose this project for the second day's class. 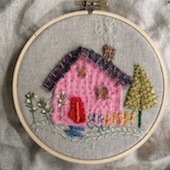 Titled "Snippets of Home", it was intensely creative, but relaxed and well-suited for a second day of crafting. We began with a stack of randomly shaped cigar boxes. Each was engineered and altered to create "rooms" for small objects and decorations. We added pockets and handmade felt embellishments. And beautiful details. Some talented students with mad skills! Apparently, it's too much for me to teach and snap photos at the same time- always disappointed that there isn't more in the camera when I get home. Some stunners got away without a photo. In the second classroom, Kathy Curotto taught a happy, busy class in papercrafting (following the first day's fantastic canvas bag class) with an array of materials and projects to take on. Amy made this one-of-a-kind carousel from bits she rummaged from the stash pile. because it was her birthday that very day- for real! More cake, goodie bags, book signings, laughs. And lingering good-byes. Such a memorable weekend! I enjoyed everything about it and felt so lucky to have been there with so many kind and inspired students, with Mary and Barbara and Kathy. They hope to repeat this event for November and the holidays. Another Breit Idea! Made it back home from the Home Companion Workshops in Saint Louis. Once again, it was a fantastic event with all the party bells and whistles to celebrate Mary's birthday and our jubilant craftorama. This was the very last shot I took as we finished tidying up the studio and then said goodbye to our weekend home. I was pleasantly surprised to find this little pillow, made from a tee-shirt I designed for Mary's company years ago - it made me happy to see it there still, beautifully repurposed, so inviting in the late afternoon light from the office window.